After Alizée was hauled out, we went to visit the Brooklin Boat Yard (BBY), the mecca for wooden boat building, for a private tour of their operations. Amazing work, specializing in modern wood construction, a specific kind of cold molded construction combined with key carbon fiber components. Bill never passes a chance to inventory the tools the pros use. One worker was using a router and plywood template to cut a partial bulkhead, just like we did for Alizée. Of course we weren't cutting 3/4" solid carbon fiber plate! Nonetheless he (ab)used our favorite ole bare bones Porter Cable Router - the router that never dies. Across the shop I picked up the familiar whine of the 3 1/3" Makita power plane, another tool found in virtually every boat shop. We discussed the hit-or-miss quality of the Chinese importer Grizzly: great thickness planer, not so much the joiner. They have two very classy projects in process, a 90' and a 60'. BBY was started by Joel White, E.B. White's son: the E.B. White, an avid sailor, who wrote Charlotte's Web, Stuart Little, and the Elements of Style. When Joel passed, his son Steve took over the yard and also co-owns the Belfast Front Street Shipyard where Alizée is spending the winter. Bob Stephens, who went sailing with us to evaluate Alizée's temperament, took over the lead designer role at BBY until branching out on his own in Belfast. His wife works at the Wooden Boat School just down the street from the BBY. 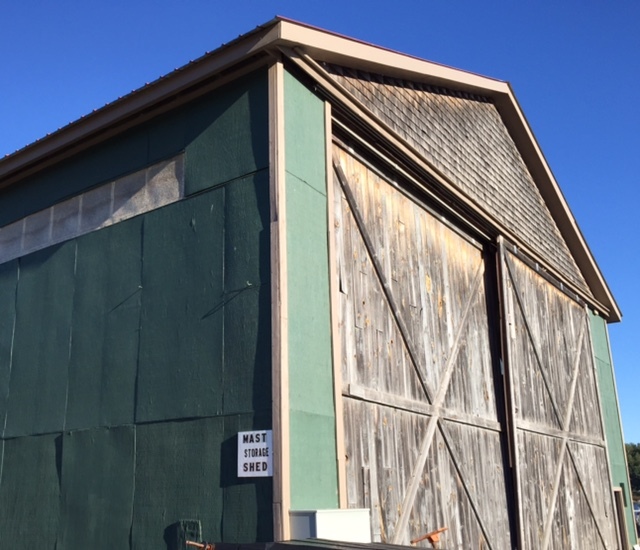 The Brooklin Boat Yard, Rockport Marine, and the Front Street Shipyard have overlapping ownership and cooperative projects: all with the undercurrent of wooden boats, whether traditional or contemporary. For example, the Spirit of Bermuda was built by Rockport Marine and was hauled by Front Street Shipyard (shortly before Alizée) for maintenance and inspection work. Wooden boats are a small world within a small world up here. 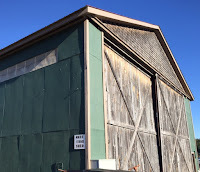 We spent three land days visiting Deer Isle, the peninsula connected to the mainland via the impressive Eggemoggin suspension bridge, spanning the Eggemoggin Reach. Always a thrill, we have sailed under her several times while enjoying The Reach. Around the corner from the Eggemoggin Reach is Stonington: lobster capital of the lobster region. From our reading, lobstermen are not exactly welcoming of cruisers, such as us, in the area, so we stayed away while aboard Alizée. Now cleverly disguised in our truck (ALL lobstermen drive trucks, though I suppose the Colorado plates were a give away), we wanted to visit Stonington and see just who has those lime green buoys with the white tops: we like him because we always see the bloody things. Stonington also happens to be a kayaker's dream land with many small and interesting islands close by. We did not get to kayak this time around but definitely adding it to next year's todo list. Deer Isle also has several preserves maintained by the Maine Heritage Trust, which works with owners and businesses to create nice hiking trails. One of those trails, in the Barred Island Preserve, lets you to walk on water, so to speak, traversing to the island at low tide. Another one in the Old Settlement Quarry Preserve, goes through an old granite quarry. Granite quarrying, along with lobstering, was a big part of the Deer Isle revenue stream. John F. Kennedy's grave at the Arlington National Cemetery was made from Deer Isle granite, as are many US monuments. We could see the season ending, making it a bit more palatable to return home. Several places had already closed for the season and we got stuck eating at the one-and-only restaurant that stays open year around. We would not recommend it and will keep its name hidden to not cause more damage. Many businesses close after Labor Day, often because their seasonal employees return to school. While there are few places to eat left open, we saw several of them closing for good after this season. Our last night on Deer Isle was at a home-built cabin with a nautical flair - the Bow House airbnb, recommended by our friend Barry. It was cool to see another dreamer build something so quaint and sharing it with others. As we started our trek back to Boulder, we had absolutely no cell service the entire way from Deer Isle to the Canadian border (maybe ATT does not recognize Northern Maine, or DownEast as they call it?) and the morning fog on land was a nice wink to the few foggy days we had on Alizée. Do sailboats dream when they sleep for the winter? Do they remember the patter of feet on their decks, the feel of a breeze, the damp of the fog? I hope so. It would only be fair that we have given Alizée something for the summer she has given us. She is all nestled into her spot next to a Valiant 40 for company during the long winter ahead. 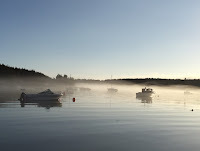 We are continuing for a few days more in Maine to a place or two that we missed, for one reason or another, by boat. Before hauling out, we strip the rig (sails, boom, mast) from the boat. There's a special dock, the rigging pen, with a well padded crane. Our lead rigger is Kyle. Together Kyle, Cath, and I strip and fold sail on the dock. As Cath heads off for that one last load of laundry, a few more riggers show up and we off load the boom in short order. After rigging a sling to the mast and some tag lines, we pull six pins and lift up the mast. The tide was ebbing fast while we were working, so the crane had to lower the mast every few minutes as the boat went lower with the tide, to keep the boat from hanging from the mast and crane! Though we can store the boom and mast on the trailer, the yard prefers to keep them in the spar shed next to the rigging pen. Since it was for their convenience, they comped the charge. Yea! We like these guys. Other professional "features" we have not seen at other yards include padded bags they slip over the turnbuckles and furler hardware to avoid scratches. The equipment itself was top notch, quite a few grades above the yard in Mystic where we launched. It was also fun to talk to Kyle about the strategies for pulling those huge raked schooner masts weighing thousands of pounds (hint, you can't pull them straight up). Once freed of her rig, Alizée had to be moved to the travel lift bay for hauling. No owner driving allowed, so I went along more for the ride. 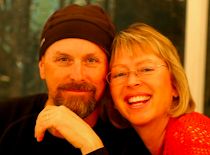 Turns out the appointed captain has a sister at Naropa in Boulder. Go figure. With no way off the boat, we just ride up on Alizée and chat about the very expensive Gunboat catamaran in the yard. 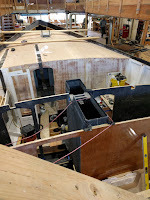 Seems these boats have a real problem with waterlogged hulls (balsa cored) and being one of the few boat yards with a travel lift wide enough to lift them out of the water Front Street has a side business repairing Gunboats. Once out of the water, there are a few quick items to take care of, primarily flushing the engine with antifreeze and washing off a season of slime from the bottom. 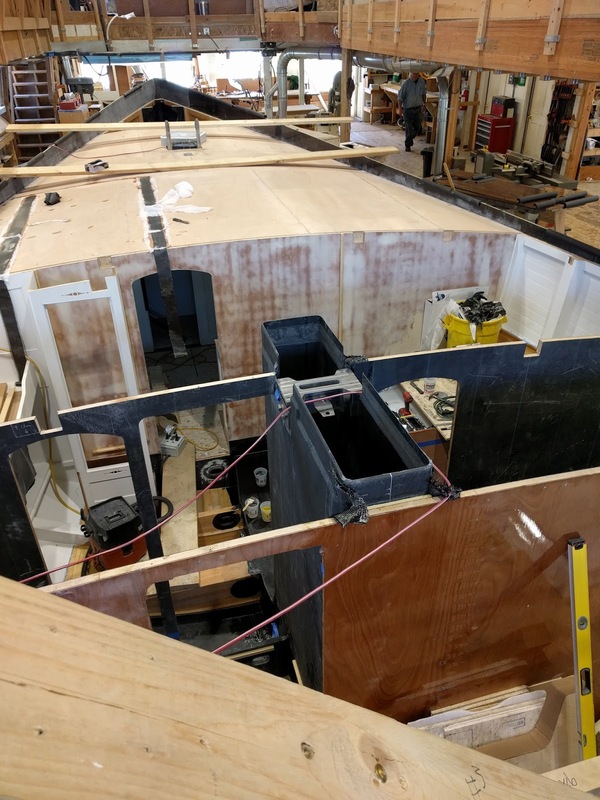 I walk around with the service manager looking for items in need of a fix, such as a hairline crack in the keel to hull fairing and the notch in the keel fairing from a lobster pot warp sawing across the keel. The latter led to a horror story of a lobster pot warp cutting into a steel keel like ours, flooding it. Nightmare repair. Alizée spent the night on display for everyone walking down the Belfast harbor walk, which runs right through the ship yard next to the travel lift bays. In this era of hyper safety, it is amazing to see these huge travel lifts sometimes carrying boats weighing hundreds of tons roll across a public walkway. Only the watchfulness of the operator and the common sense of the walkers not to put toes under an eight foot tire carrying an ocean tug, ensure the safety of the proceedings. In return the shipyard is tightly integrated, in a good way, with the community and the public can view the hauling of some of the worlds most incredible boats, like Alizée :) Good for all and great fun. Bright and early (7:30AM) we have an appointment with the service manager for a few last minute things before moving Alizée into her offsite storage. They have a Freightliner to move her the few miles to storage, but there's a hitch, literally, in the giddy-up. Alizée's trailer is low slung, I mean just inches above the road way, to get her low enough for bridge clearance. The Freightliner can't get low enough to hitch up. Hmmm. Fortunately, the Freightliner and our RAM pickup (which we used to haul Alizée) have the same receiver size so we use the hitch from our pickup. Could be lower, but good enough for a short distance. A little worried about ground clearance for the hill climb out the north exit of the yard, they take Alizée around south and up Main Street in Belfast, followed by a chase truck to watch for power cables, branches, and such. I suspect the boom crutch snatched at a few because there were some twigs and leaves in the cockpit when we went to say goodbye in her shed! Alizée has the street to herself with a sidewalk of onlookers. A parade all to herself! I think she may have blushed, modest girl that she is. We left IAH (Isle Au Haut, not Dullus airport) Wednesday to begin our journey back to Belfast for the weekend. No sooner had we made it into Penobscot Bay when the fog rolled back in. Again. It has been foggier than we have seen so far even though the fog should be thinning out in September. 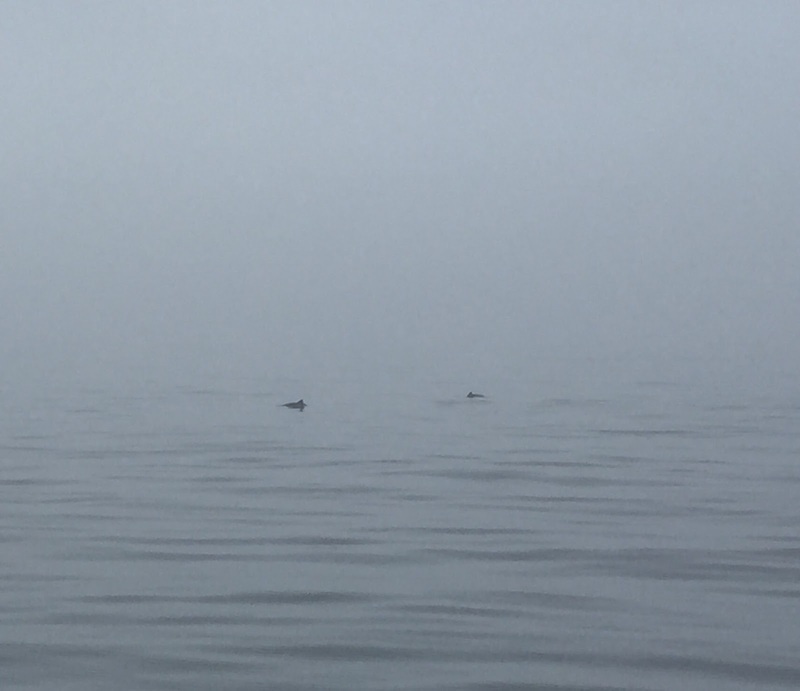 Excitement in the fog: porpoises! We are getting used to fog, fact of life sailing up here like the lobster pots, but enjoyed arriving at Winter Harbor where it opened up to sun and warmth enough to jump in one last time (67F water temperature) - well I chickened out but the captain enjoyed scrubbing Alizée's waterline in the balmy water. We were the only boat in this beautiful harbor with just the seals for company - crazy sauce. Our next leg to Pulpit Harbor, a favorite, on North Haven was the foggiest yet. 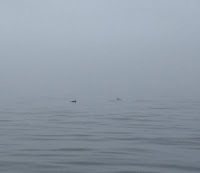 We entered the Fox Islands Thorofare with 1/10 mile visibility. By the time we reached the village of North Haven, it looked like a wall of fog. Fog thicker than fog. The fog within the fog. Since there was no scenery to enjoy beyond the chartplotter, we eaves dropped on the working VHF (radio) channel schooners use. Their captains were a riot to listen to. "We are sooo fog sick around here" and "The fog is so thick we have the guests wearing bells so we don't loose them". Nothing for it but to drop the hook and have lunch! By the time the dishes were done, it lifted just enough to continue on; luckily with only few lobster pots to dodge and even some porpoises waving cheering us on. Porpoises are not as playful as dolphins, so they don't come close to our bow to swim along but we like them, and the puppy-face harbor seals just as much. Only lobster boats were working in that pea soup, bless their hearts. We made it to Pulpit Harbor where we must have been the only boat anchored, all others were on private moorings: clearly indicating the pleasure boats season is coming to an end. Friday morning the sun finally came back after the morning fog gave us some awesome harbor scenes. Friday was special as it was our last day sailing for the season. To kick off, we met Alison Langley, a local marine photographer (no Shelby not Alison Langley your classmate!) in the morning at Pulpit. Alison did a photoshoot for an upcoming (we hope) Wooden Boat Magazine article featuring our girl Alizée. This was the third and last step of the process involving us. First we were interviewed several weeks back by Bob Stephens, a well respected boat designer from Stephens Waring Boat Design. Then Bob sailed Alizée we us to check her temperament. Last the photoshoot which benefited from both sunny weather (no fog!) and enough wind to show her off barreling upwind at seven knots. For a keepsake and to share the experience with landlubber friends, we took a short video of her last sail, in west Penobscot bay just off Camden, of the season, along with schooner Victory Chimes. Now in Belfast, we are getting Alizée ready for her haulout Monday. Remove sails, shuttle clothes and stuff to the car, finish food, laundry mania, clean, clean and clean more.... Sadly we still have yet to find my July birthday gift that Bill hid so well! 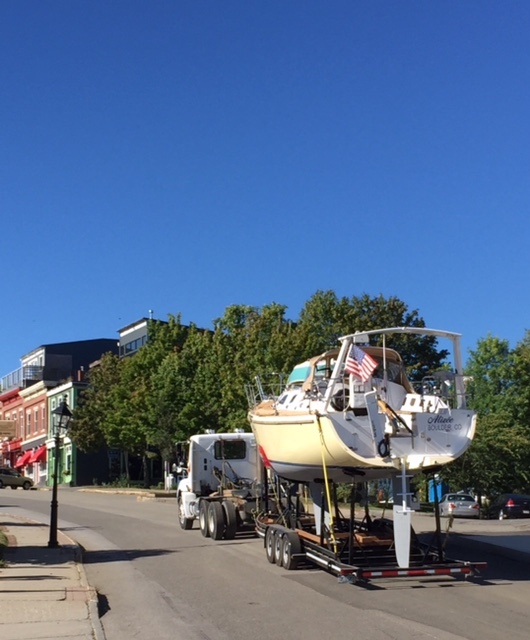 While lately most nights have been as warm as when we arrived in July, tomorrow night should be 47F, brrrr, so we are coming to terms with taking Alizée out of the water for her winter storage (at the Front Street shipyard in Belfast) and to the idea of heading back to Colorado. We are definitely not keen on the idea of driving a rough riding truck 37 hours back home. Double ugh. Many months, even years, ago, one island, Isle au Haut, one harbor, Duck Harbor, called to us. On many of our Penobscot tours we've been close, but lacked that extra day or two needed to keep heading out. Now down to just the two of us and down to our last precious days this Summer, we are bound (not destine - the difference is subtle) for Isle au Haut. Tropical storm Hermine is still no direct threat, but giving us grief. Rather than the prevailing southwest winds of Summer, we have a gusty northeast breeze. Our first leg is a modest hop from Belfast to Northwest Harbor on Deer Isle, which has excellent protection from the northeast. In the morning, the wind still blows from the northeast and the swells from Hermine are building. Small craft and high surf advisories are issued by officialdom. We have many options for the next leg, plan A Duck Harbor, plan B the town of Isle au Haut, plan C Seal Bay on Vinalhaven. We head down Penobscot bay splitting the difference between Isle au Haut and Vinalhaven to keep our options open. The swells are clearly building as the morning wears on. As much as I have dreamed of Duck Harbor, we have heard conflicting reports about how far in a boat of our size can tuck out of the ocean swells and I'm nervous knowing that the anchorage is tight for a 40' boat and the swells likely bouncing back and forth at the entrance and down the harbor some distance. Duck Harbor is out. Rats. The anchorage off the town of Isle au Haut is tiny with no room to anchor and just a few moorings for transients (boats passing through). Normally, it is also open to the prevailing southwestern winds, but ideal for the northeasterlies we have today and tonight. If there's no room, we still have day light to bail to Vinalhaven (forget sailing at night with the lobster pots). Perfectly on queue, the weather is becoming cooler and the cold fronts more frequent. I tell Cath not to let me out of the cabin today without my flannel lined pants. Thin blooded, the last few sails have chilled me to the bone while sailing in shorts and a fleece top. We used to jump in the water at each anchorage. We don't do that anymore. Places that haven't shut down are reducing hours. Though still a few weeks off, Fall is effectively here and Winter is coming. We commit to at least having a look at Isle au Haut. The entire coastline here is basically submerged granite mountains. Underwater lurks unseen peaks that may show themselves only at low tide or perhaps lurk just below where the only clue is how the waves curl as they pass over the tops. We play it safe and don't cut any corners even if the charts seem to indicate we could. From another life as a pilot, a flight instructor told me that if you insist on killing yourself in an airplane, at least do it in a novel fashion rather than scud running or looping a 172. Translated to sailing, if you're going to sink a boat, don't do it by cutting inside a marker. Luck (and the late season) is with us and there's a mooring available at Isle au Haut. Wahoo! We made it to Isle au Haut! Wahoo again! With some 50 year round residents, there's really only one thing happening here: lobster. The boats around us are lobster boats, some looking sweet, others a bit in the rough. Rural Maine's devotion to the honor system has a pleasant quaintness to it. On the roads, we see unmanned stacks of firewood, even produce stands, where you take what you like and leave payment in a can or jar. Thus, it is not terribly surprising to find that the transient moorings here have a Coke bottle in which you leave payment for using the mooring for the night. Isle au Haut is unique in more ways than we could possibly enumerate. One could imagine the interesting politics in a town of 50 or so dominated by the lobster trade. If you're curious, read The Lobster Chronicles, as Cath is doing now. The author of The Lobster Chronicles, Linda Greenlaw, whom you might recall as the female swordfishing captain from The Perfect Storm, and a large branch of her family tree, hail from Isle au Haut. 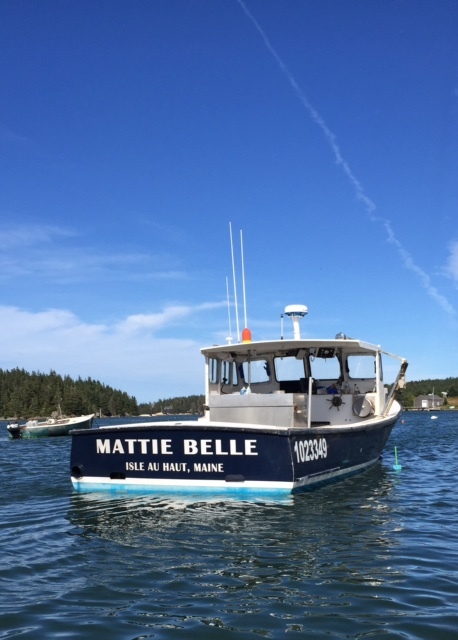 She keeps a lobster boat, the Mattie Belle, here, a stone's throw from our mooring. Unfortunately for us, the other well known fixture of the town, The Maine Lobster Lady, has closed down for the season, just a few days ago. Double rats. All these lobster boats and no where for us to get lobster, or any eats at all for that matter. In addition to a small, essentials (like milk, ice cream, and beer) only grocery, there is what must be the smallest US Mail Post Office, complete with a wood burning stove to keep all those letters toasty during the hard winters here. A small locally owned ferry runs the six mile between Stonington on Deer Isle (read the mainland, reachable by car) and Isle au Haut. Mail aside, the ferry brings in the morning, and removes in the afternoon, day trippers. Would you really make a day trip to Isle au Haut to just buy bourbon in a can at the grocery? Ah hah. That's the little secret. Sixty percent of Isle au Haut is part of the Acadia National Park. Probably because of the politics involved in the acquisition of the land, THIS part of Acadia is not allowed to be advertised. If you don't ask about it, you won't know about it! Aside from the limited space on the ferry, the only way to get here is by boat or kayak. The ferry can carry perhaps 60 people, but in our limited sampling we see only six or so arriving each day. We've also seen five kayakers. And then there's us and another boat. Let's see - that makes 15 people in the park today. Not too crowded.